When the Hyundai Sonata Turbo and the Hyundai Sonata Greenwash Hybrid are unveiled at this month's New York Auto Show, Hyundai exclusively told Jalopnik they believe the two will cancel each other out. "No harm, no foul," we're told. 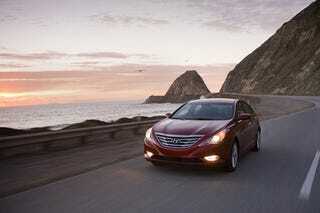 2011 Hyundai Sonata: Now With Even More Camry-Like Style!